There are many species of tortoise available in the UK, each with different needs, so be sure to do your research and speak to an expert before purchase. The most common species kept in the UK is the Hermann’s Tortoise, other species include Spur-thighed, Marginated and Horsfield’s. Tortoises will grow each year given the right conditions and their shell scutes grow similar to the rings of a tree. Many tortoises live around 80-years-old or more in ideal conditions, so be sure you are ready for a lifetime commitment. • Diarrhoea: This can be caused by incorrect feeding or an internal parasite infestation. • Mouth rot: Cheesy deposits in the mouth. • Soft or deformed shell disorders: Can be due to poor diet, a lack of calcium and/or vitamin D3 and/or incorrect lighting. Your tortoise should be bathed weekly, ideally before feeding, in order to ensure proper levels of hydration, and weighed regularly to ensure it is growing at a healthy rate. For the first 10 days of ownership, bath the tortoise every day in lukewarm water for 15-20 minutes to encourage him to be active and not become dehydrated from stress. Some reptiles carry a form of salmonella, which is usually contracted by ingestion. Good hygiene and hand washing after handling should be sufficient to prevent any risk of infection. Tortoises should have access to both indoor and outdoor space. Indoor accommodation can comprise of a purpose-built enclosure, often called a tortoise table. Alternatively, a large vivarium with good ventilation can also be used successfully over limited time periods. The minimum indoor enclosure size for an adult should be 3m x 3m in bad weather, but the bigger and more varied the habitat is the more likely the tortoise is to do well. garden so the tortoise can benefit from vital natural UV sunshine. All outdoor accommodation should be predator-proof and a fully covered enclosure is essential for small tortoises to protect them from predators. and 30-32°C at the hot end. Night temperature can safely be dropped to 18°C or slightly lower. Thermometers can be placed at each end of the enclosure to monitor the temperature range and the overall temperature should be controlled by a thermostat. Heat can be supplied by basking lamps that should be kept 6-12 inches away from the basking area. Your pet shop will advise on heating products and their suitability for your tortoise. Reptiles need UVA/UVB lighting to absorb the calcium in their diet. This light should be left on for 10-12 hours in the day, and the bulbs will need replacing regularly as the UV output decreases with use. The floor of the accommodation should be covered with 3-4inch deep suitable substrates such as Tortoise soil mix such as ‘Tortoise Life’, coco peat or sterilised topsoil. If using a product like topsoil, we recommended that you feed the tortoise on a slate to avoid him eating the substrate, resulting in possible gut impaction. Provide a shelter, perhaps a tunnel or flower pot. Ensure heated areas remain simple to reduce the possibility of your tortoise overturning in heat. Substrate should be sprayed or watered regularly to keep healthy humidity levels and prevent breathing problems due to dust. Remove droppings and uneaten fresh food daily. Water and food bowls should be washed, dried and refilled daily. Vivariums should be completely cleaned with a pet-safe disinfectant regularly and the soiled substrate should be disposed of and replaced. Before you consider hibernating your tortoise, check it is a hibernating species and if it is a good weight, and showing no signs of illness. Length of hibernation varies between age and species, so consult an expert and never exceed more than 12 weeks. An annual pre-hibernation check with a knowledgeable vet is always advised. With correct preparation, hibernation can be a safe and beneficial process for your pet, helping to simulate a natural pattern. Your tortoise should be fasted for 2-3 weeks before hibernation, though fresh water must be provided. Your hibernation box should be well ventilated and be made of rat-proof materials. The optimum temperature is 5°C, and should not fall below 2-3°C or above 8°C. You should check your tortoise at regular intervals during hibernation. A reliable refrigerator set at the correct temperature can be ideal for this purpose. Monitor temperatures in hibernation locations prior to use and throughout hibernation. 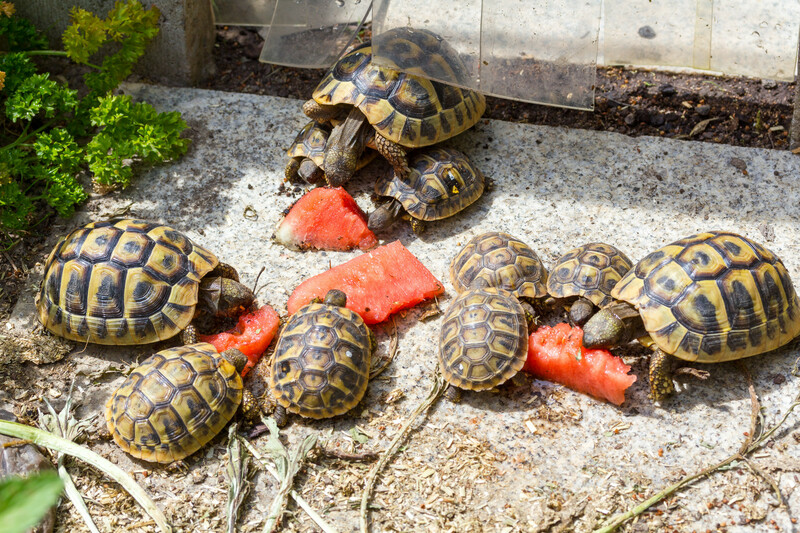 Tortoises are herbivores, so they need a varied high fibre diet low in fat and protein. Commercial pellets are available as part of a balanced diet and your pet shop can advise. Tortoises should eat a very varied diet of weeds and flowers with calcium supplement to remain fit and healthy. Safe foods include plantains, dandelion, clover, sow-thistle, catsear, honeysuckle, lavateria, sedums, pansies and violas. Remember, ‘treat’ food such as lettuce and cucumber should be fed in moderation as it contains no nutrients, only water. Junk foods to avoid include vegetables, fruit and processed food. Be careful not to overfeed your tortoise, one meal per day is plenty. If housing your tortoise outside, you can buy a prepared mix of tortoise feed seeds, which you can plant for the tortoise to encourage foraging. You can also grow the seeds to pick and feed to your tortoise as you please. A calcium supplement and a separate multi-vitamin should be added to the food provided. Fresh water should always be available. Tortoises are protected by CITES regulations. be micro-chipped when big enough if being sold. Mediterranean tortoises are protected by CITES regulations, all can only be legally sold (with the exception of the Horsfield’s tortoise), with a DEFRA Article 10 Exemption Certificate. They must be micro-chipped when big enough if being sold. Soft shell disorders: can be due to a lack of calcium and/or vitamin D3 and/or incorrect lighting. Your tortoise should be bathed weekly in order to ensure proper levels of hydration and weighed regularly to ensure that they are growing at a healthy rate. If you are at all worried about the health of your tortoise you should consult your vet or a specialist reptile vet as soon as possible. Some reptiles carry a form of salmonella. Salmonella is most usually contracted by ingestion. Good hygiene and washing hands after handling or cleaning your tortoise should be sufficient to prevent any risk of infection.